We collected William and his mum from The Red Lion, Burnsall before returning for Katie and her dad from The Devonshire Fell . The ceremony was held at Bolton Abbey Priory with the Bride and Groom having photographs in the grounds and ruins. 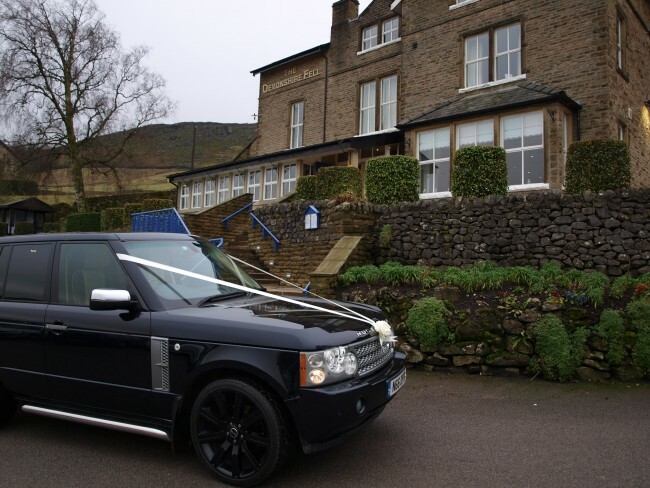 Our Range Rover Vogue was their chosen car for their special day. An added bonus of heated seats which were welcomed by them both for their journey back to the reception at The Devonshire Fell along with their chilled Processo. Ripon, Harrogate, Knaresborough, Boroughbridge, Pateley Bridge, Wetherby, Leeds, Boston Spa, York, Northallerton, Thirsk, Bedale, Richmond, Leyburn and the outlying areas. We will consider travelling further afield but you will appreciate that the price will be reflective of the distance we need to travel to get to you. © 2012 Copyright by Aquarius Wedding Cars. All rights reserved.